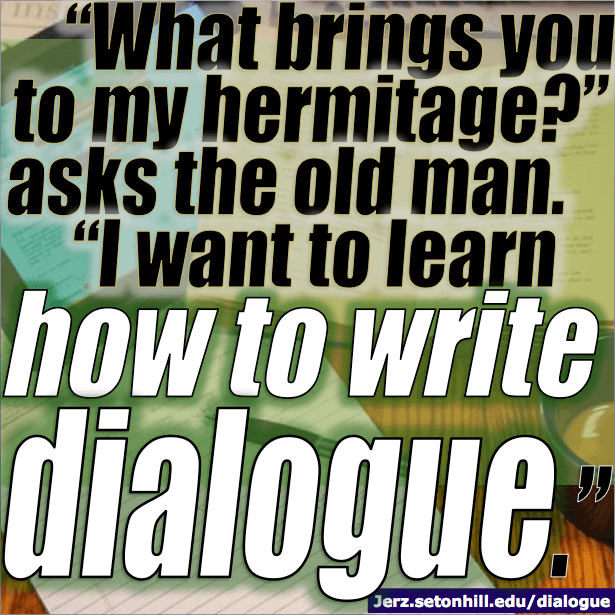 “What brings you to my hermitage on such a stormy night?” asks the old man. “Are you?” he says. His eyes take me in for a moment. Then he opens the door. “I want to know where the punctuation goes,” I say, wringing out my cloak in the hall. I fish Divergent out of my pack. There’s some dialogue on page 2. “So today is the day,” she says. “Each speech gets its own indented paragraph,” I say. The old man hums to himself patiently, as the fire crackles. I skip ahead to page 5. “You aren’t at all worried about what they’ll tell you?” I ask Caleb. I could tell him I’ve been worried for weeks about [blah blah]. I walk toward Faction History, chewing on my lower lip. He never answered my question. “What can you tell from that passage?” the old man asks. “What do you mean?” I say, my brows furrowing in confusion. “I think I understand,” I say. Smiling, the old man fills another teacup, and offers it to me. Outside, the wind howls. The old man puts another log on the fire. I sip my tea, feeling it warm my insides. 31 Dec 2014 — first published. 09 Jun 2016 — minor edits. I am pilfering this for my creative writing class this semester! Please let me know what they think. I’ve been meaning to write something like this for years. Finally got to it. Misty Bhatnagar liked this on Facebook. Misty Demangone liked this on Facebook. Sometimes the answer is hiding in plain view while we are thinking so much on it….when its right there. Maya teaches me that everyday! This is excellent. May I share it? Carol Daugherty Guthrie liked this on Facebook. Excellent dialogue. Message brought out beautifully! I’ve never read something quite like that. It was very clever and educational, thank you. I found this piece very enlightning as I have found my punctuation very suspect and has been commented about whilst I have been submitting course work ona a writing course. I have other faults but punctuation is probably my main problem along with my writing too fast and not reviewing my piece correctly. Any advice is totally welcome. Thanks again for the writing pointers you share with us. I hope you can give me advice about a fiction story that I’m writing. of a struggle to write on. getting to a point to make this happen. make it happen between the characters. Anthony nodded somewhat surprised, he replied, “yeah….. and you must be Erin? Erin smiled, while she stuck out her hand, Anthony shook her hand. tucked her purse beside her chair on the floor. That’s really an out-of-the-box example of punctuation in creative writing. Thanks for sharing.! Thank you so much for this Dennis G. Jerz. The way you presented this was done extremely well. I can already sense the piece of writing above is something which will forever change the way in which I think about anything I write, not just dialogue. I have long hoped to put together a piece of writing, though this is the first research I’ve ever done on how to even make a start on making a start, and to stumble onto something as excellent as this as my first exposure really makes me feel optimistic about finally putting something together. Likely to be one of the all-time classics of the future, and I will make a point of making a special mention to you when that day comes. Good on ya and thanks for sharing! just like in my class in barn burning (in the store in which the justice of the piece sat) everyone thought it was in a court. bt its actually in a store. thing is in plain sight when we are looking hard to find the setting.